Somerset stormed to a 10-wicket win against Glamorgan at Taunton as Marcus Trescothick and Craig Kieswetter knocked off the 129 runs required in less than 15 overs. 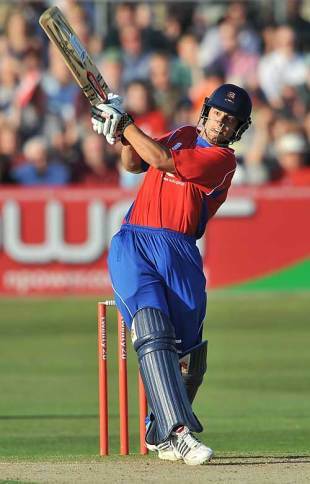 Trescothick belted 69 off 47 balls, while Kieswetter hit three sixes in his 57 to continue a rich run of form. Somerset's display in the field set up the victory as they didn't let Glamorgan build momentum. Jamie Dalyrmple hit 56 but lifting the scoring rate proved a problem. Charl Willoughby produced an economical four overs to finish with 1 for 16. Half centuries from Vikram Solanki and Steven Davies laid the foundation for Worcestershire as they beat Gloucestershire by 13 runs at Bristol. The pair added 102 for the first wicket and a late flourish from Ben Smith (41 off 20 balls) helped push the total to 188 as he added 71 with Stephen Moore. Gloucestershire were handily placed at 98 for 1 with Hamish Marshall and Alex Gidman going well, but Marshall fell to Chris Whelan and the middle order fell away. Gidman was fourth out for 64 off 50 balls and the death bowling of Daryl Mitchell and Ashley Noffke proved too good. Northamptonshire made it four wins out of four with a comprehensive 24-run victory over Warwickshire at Edgbaston. Rob White cracked seven fours in his 47-ball 59 while there were pairs of 19s from Andrew Hall and Johan van der Wath. Seeking 156 Jonathan Trott propelled Warwickshire's chase with 44 from 34 balls, and Ian Bell stroked 24 from 26, but they lost crucial wickets at regular intervals to leave their lower order with too much to do. David Willey finished with 2 for 17. On the eve of England's World Twenty20 campaign, Alastair Cook gave the selectors a reminder of his ability with a thumping 77 from 55 balls, to help lead Essex to an equally impressive 36-run over Kent Chelmsford. Cook, who was not picked for this year's event, struck nine fours and two sixes and put on 90 for the opening wicket with Mark Pettini (40). Grant Flower helped Essex pass the 200 mark with a scorching assault of 61 from 30 balls. And Flower starred with the ball, too, nailing 3 for 26 as Kent struggled to put together partnerships in their chase of 206. Martin van Jaarsveld top-scored with 33 while Joe Denly made 32 at the top of the order but, unlike Essex, there were no blistering contributions. Sussex condemned the Twenty20 Cup holders Middlesex to their fourth consequtive defeat, beating them by the comfortable margin of seven wickets at Hove. Middlesex were bowled out for a dismal 116, with Gareth Berg top-scoring with 33 from 28. Tyron Henderson and Shaun Udal, batting at No.3, each smacked 20, but Michael Yardy and Rory Hamilton-Brown took six wickets between them to limit Sussex's target. Hamilton-Brown then led with the bat, scorching 69 from 47 as Sussex cruised home with more than three overs to spare.